Check out THE GATHERING! It has a new website! No… really… I caught a hummingbird with my bare hands. Ms P and I were in the Gvegas Wallyworld perusing for merchandise and groceries. While sacking up a bunch of moderately unripe bananas, I caught the flash of a green dart in my peripheral. Like a grown, responsible person, I left my personal goods (cel phone and keys) in a basket, in the middle of the aisle, and went to check out the green dart. As I rounded the corner, it passed me again and settled on a huge stack of brightly wrapped flour tortillas. I’m not sure how it got in there, but it was a hummingbird! The poor thing was continuing to flap it’s wings, but it was evident that it was exhausted, panicked, out of gas and out of it’s element. My thought: “Hey, you’ve read about this in Bird N Bloom. Just catch it, take it outside and let it go free.” So that is exactly what I did. The thing never moved. I, like the stealthy jungle cat hunter I am, crept up from behind, cupped my hands over it, much like trapping a butterfly, and scooped it up. I was so excited that I left my cart again and began walking all over Walmart looking like I might be cradling a dried cat turd or something. I needed Ms P to verify my capture. To no avail, she was AWOL, so I headed out doors. There in the parking lot of Sam Walton’s dream-child, I set the captive free. When I raised the lid of my right hand, the stunned little thing just sat there. I actually had to toss it airborne to get him going again and off it flew into the wild blue yonder. Now, I’m fist-pumping and doing the happy dance about a hummingbird’s deliverance. Then I realized there was a large Hispanic family gawking at my celebration. A beautiful almond-eyed little girl was giggling at me. Crazy gringo. So, I went back inside and resumed my duties. It was too odd for me to not keep thinking about it. One of God’s creatures in a spacious environment that is full of food and nourishment, but it can’t really eat because none of the food is packaged or palatable for what it really needs naturally. I wonder how much of this is true for the Body of Christ? There actually is stuff in Wallyworld that the little critters can eat, but it has to be prepared. 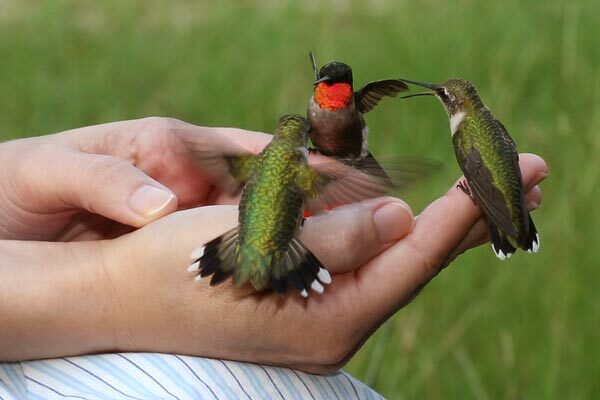 I feed hummingbirds at my house. No food coloring, 1/4 part sugar, 3/4 water, put on the stove, brought to a boil, cooled, and served in a hummingbird feeder. Simple. This agitated love affair that I have with the institutional church presents about the same dilemma: (lots of food, lots of potential good, that gathers a lot of hungry people because they’re attracted to the packaging, or the music, or the comfort of the pew, or how the preacher teaches, or… well… just fill in the blanks). Most churches are full of tired people who are flapping the hell out of their wings trying to get something from God. Exhausted, hungry, panicked, disoriented people who are starving to death for the real food they need. Another good sermon? GIVE ME A FRIKK’N BREAK! Excuse me while I hurl. How about the connection with someone, anyone, who really sees them, knows them, feels them and moves toward them in sincere love? Not because of what they can do or what they give or what they can even add… but, just plain ole valued because someone sees inside their heart. That’s the food we need. I’m pretty sure that there are people who show up on Sundays just hoping that someone talks to them. That’s the food that feeds our soul! The touch is what heals. I’m not a church hater. In fact, I’m quite the opposite. I love the church… institution and the Body, but we need to figure out why we feed where we feed. It’s not because He said to. He didn’t say anything about our going to church. Tradition, ritual, guilt or denominational affinity isn’t a good reason either. Bright and shiny packaging doesn’t mean jack-squat! I know why we do The Gathering in a tightly-packed little basement. He told Michael and I that it is to be “church”. An assemblage where love, relationship, fathering, mothering, sonship and daughterhood is all supposed to blend and develop into authentic discipleship. Just belonging and showing up is not enough by those standards. It’s got to go deeper than what we’re normally comfortable with. It requires us to figure out some stuff about ourselves. It’s messy, sometimes glorious, often in your face and hopefully affecting your heart and equipping the saints for the work of service. I’m pretty sure that Michael, Kathy, Patti and I, have figured out and settled that we’re all in. The Gathering is our church… our feeder… our home… our place. We love the fact that a few friends, sons and daughters have decided the same!